Seventy-five years ago, East Anchorage was mostly spruce forest. Anchorage pioneer homesteader Arnold L. Muldoon backpacked building materials along a muddy trail that became Muldoon Road. He put up a log cabin in the winter of 1940-1941 and tried his hand at farming. Read the story of how Muldoon Road got its name! And we have a long way to go! √ Muldoon Farmers Market – Saturdays 9-2 at Begich Middle School June 27 through September 26, 2015. The Muldoon Farmers Market is a volunteer-run, community-based, not-for-profit effort to create a quality farmers market by the mountains in East Anchorage, Alaska. The organizers are volunteers from the Northeast, Russian Jack and Scenic Foothills community councils who saw a need for a place to buy Alaska grown, caught, and made produce, food, arts and crafts in Muldoon. √ Channelizing Muldoon Road – Muldoon Road has a higher crash rate than other similar roads in Alaska. The safety improvements are to benefit pedestrians, bicyclists and automobiles. The project is to reduce the number of left-turning, rear-end, and head-on collisions in project area. Safe Access is Good for Business document explains important safety impacts of carefully controlling and managing access along roadways. Construction – Summer 2015. √ Chester Creek Realignment – Construction – Summer 2015. Muldoon Town Square in a new 29-acre community park on the old Alaska Greenhouse site, Muldoon at DeBarr – park master plan process began September 2015 – Construction – Spring 2016. Farewell to 2,600 departing JBER Airborne Brigade troops – ? 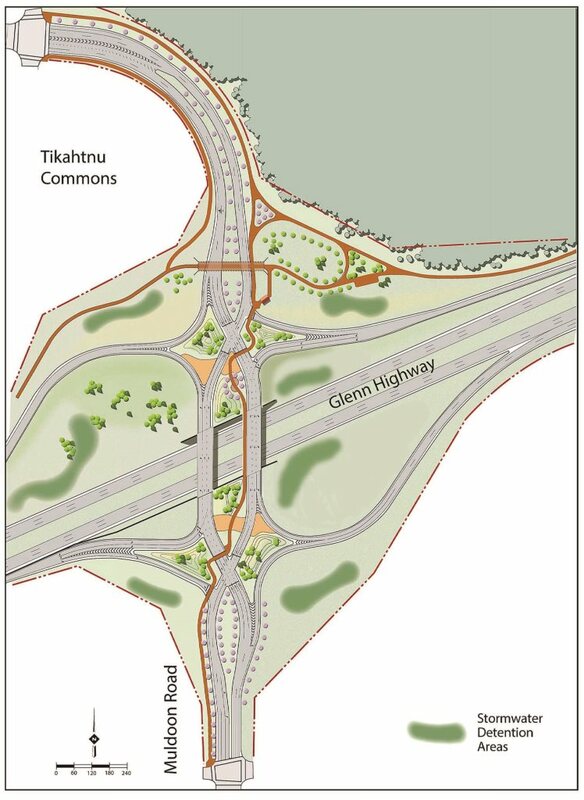 Glenn-Muldoon Interchange – Construction – Spring 2016-Fall 2018. CLICK HERE to view DOT&PF construction phasing graphics. This entry was posted in Uncategorized and tagged 2015, Arnold L. Muldoon, August, channelize, Chester Creek, creek, farmers market, Glenn, interchange, JBER, Muldoon, Muldoon Road, Muldoon Town Square, projects, realignment. Bookmark the permalink.